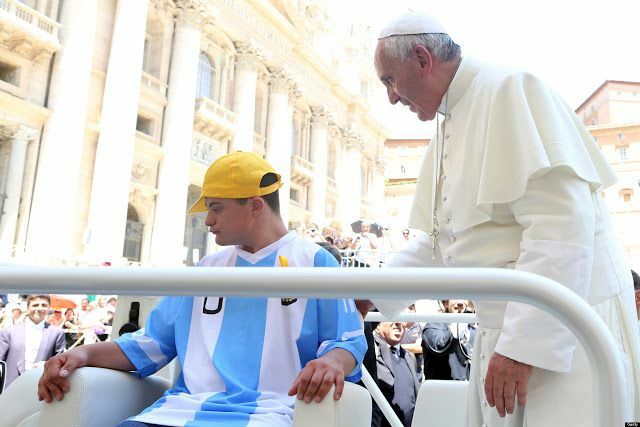 Pope Francis offered Down Syndrome teenage Alberto di Tullio a very rare privilege during his general audience last week – a personal tour of the “Popemobile”. The pontiff invited Alberto di Tullio, 17, up onto his open-top Mercedes at the end of his general audience on Wednesday while tens of thousands of people looked on. The boy’s father, Celestino di Tullio, told reporters how he choked up when Pope Francis approached his son. He said the Pope saw him and embraced him. When the boy pointed to the car, Pope Francis invited him up. Footage shows Pope Francis and Alberto di Tullio chatting on the open-deck of the “Popemobile” before the teenager had a go in the pope’s white swivel chair.